She spent the first 10 years of her life in the ocean off the coast of South Korea with her family. Then, captured accidentally in a fishing net, from which she should simply and promptly have been freed, she was instead sold to the Pacific Land Aquarium, where she spent three years in a tiny underground pool, forced to do tricks to entertain customers in exchange for food. Finally, the Mayor of Seoul stepped in and ordered Sampal the dolphin and her two pool companions at the aquarium to be released. In May, the three dolphins were taken to a sea pen so that they could re-learn how to take care of themselves in the ocean. A month later, part of the netting tore open. And while dolphins normally don't like swimming through small spaces, Sampal decided to make a run for it anyway. She escaped through the hole in the netting, hung around outside the sea pen for a couple of days, and then, before her caregivers could figure out how to get her back inside, she headed out into the great blue beyond. Three days later, she was spotted about 60 miles away, swimming with her own family – a pod of about 50 dolphins. Home and free! All too often, dolphins are not given this opportunity. Dolphins represent millions of dollars in annual revenues for any facility, like Pacific Land, that can get their hands on these oceanic beings and manage to keep them alive in captivity. 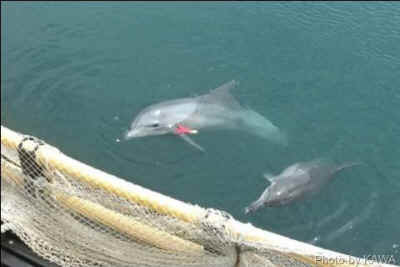 The captivity industry claims that rehabilitation and release projects, such as Sampal’s, are doomed to failure and are dangerous for the dolphins themselves. Some surmise that these concerns are not for the dolphins, however, but for the negative financial impact on companies that profit from exploiting innocent lives. Not many dolphins have been successfully returned to the wild. But last year, after six years in a disgusting, insanitary pool at a dingy resort in Turkey, two dolphins, Misha and Tom, were successfully rehabilitated by the Born Free Foundation and returned to the Mediterranean. Hundreds of dolphins in captivity today are in the same category as Sampal and Misha and Tom – fully capable of being rehabilitated in sea pens and then released into the ocean. All that's required is the will to do it. 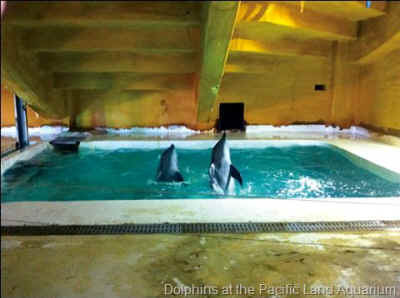 Marine circuses and aquariums argue that other dolphins are not good candidates for release into an unfamiliar ocean. They include those who were born in captivity or have been in captivity so long they have no family to go back to and/or have forgotten how to fend for themselves. But sea pens are a very practical option for them. In my work with the Nonhuman Rights Project, we will soon be going to court on behalf of a series of individual animals, including dolphins, who fit the profile of a "legal person" with the capacity for basic legal rights – like the right to "bodily liberty." These are nonhuman animals who have been shown by scientists to have high levels of cognition, including self-awareness. In seeking the release of dolphins from captivity, it will be important to have ocean sanctuaries where they can have a new home for life or be rehabilitated in preparation for release. This week, we have the very encouraging story of Sampal. And at the Nonhuman Rights Project, we look forward to filing suit on behalf of a dolphin like her so that we can see her either returned to her true ocean home and family, or given a new home in a sea pen where she can, at very least, see the sky and feel the ocean and live a life closer to what nature intended.